Julia's Anmal Sanctuary is the only vegan sanctuary in all of Colombia, and the only shelter in all of South America that protects cows. In a meat-eating culture like South America, that is a big deal. 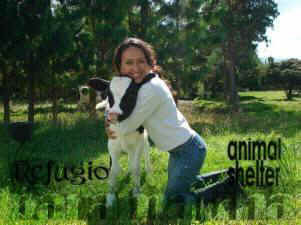 The main goal of the shelter is to teach humans to respect all living beings. Paramatma is a Sanskrit word that means, “God within the heart” and it is Juliana and Edicson's belief that all living beings have a soul and that God is in everyone’s heart. Food for Life Global is happy to welcome our newest affiliate, Julia's Anmal Sanctuary in Colombia. Founded by Juliana Castaneda and Edicson Jem in 2009. The 19,000 sm property in Guasca-Cundinamarca shelters 34 animals (21 dogs, 7 cats, 1 rooster, 1 quail, 1 lab rat, 1 horse, 1 cow and 1 ox) get the love and respect they deserve. Many animals today do not get the love and respect they deserve. Julia's Anmal Sanctuary began in 2009 with a desire is to protect one of the most abused animals in the world: cows. In the United States alone around 5 billion cows are killed annually for food, while hundreds of thousands of dogs and cats are abandoned by their owners. The animals at this shelter were abandoned or rescued from slaughter houses and test laboratories. Juliana is the sole money earner and every penny she makes from working in the city goes to help protect and feed her animal friends. Sometimes her and Edicson have to survive off bread and corn just so that the animals get the very best vegan foods she can provide them. Food for Life Global’s primary mission is: to bring about peace and prosperity in the world through the liberal distribution of pure plant-based meals prepared with loving intention.